Our goal when you travel with Ntaba African Safaris is that you are satisfied beyond expectation. Our greatest joy is hearing from clients that their dreams were reached and that we were able to help reach them! Patty Peavler, who resides in Frankfort traveled with us this year on our 2016 April Discover trip to South Africa, Zimbabwe, & Botswana. She took it upon herself to write about her experience and is putting it in the local paper. We thank you for your enthusiasm and kind words, Patty! Ntaba African Safaris is beyond thrilled to see you & our other travelers so pleased with their involvement with us, and with Africa. Read what she has to say about her expedition below. We can’t wait for you to have stories of your own like this! Also read it on the State Journal webpage! We’ve all used the phrase, it was the trip of a life time but now I have actually experienced a trip so informative and life enriching I doubt I will have another as grand. April 12th I began a journey to South Africa, Zimbabwe and Botswana with customers from Farmers Bank and several from other parts of the country. 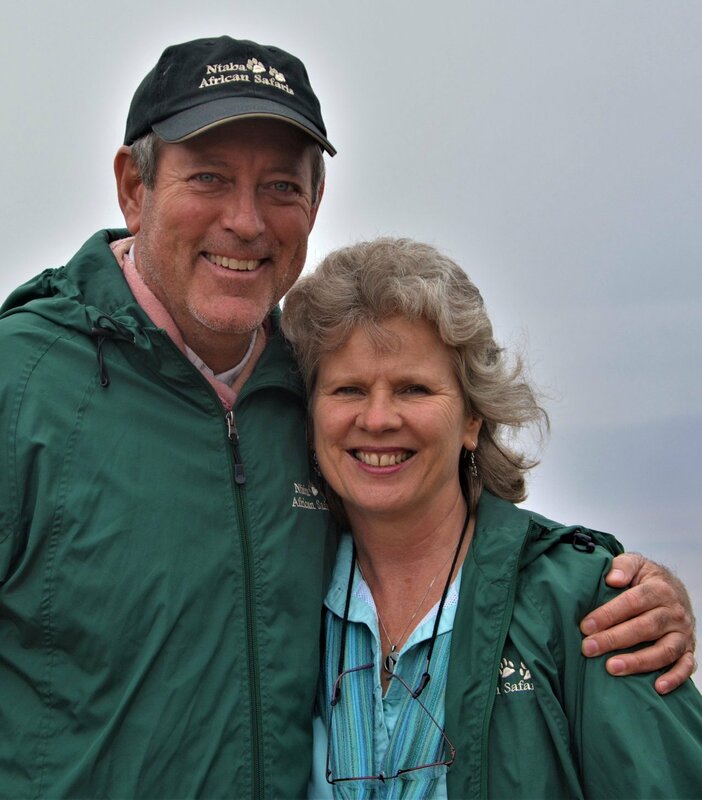 We were under the care and guidance of Ntaba African Safaris which is the Frankfort based company started ten years ago by Stella and Robin Mountain. Both are South African natives whose name Mountain is Ntaba in Zulu. The journey began by flying from Louisville to Dulles near Washington DC where we boarded a South African Airways jet for Johannesburg via Ghana. Here the plane refueled and a fresh crew and pilots took over after seven hours coming across the Atlantic. Five hours later we were collecting our bags to go through customs then boarding another flight which took us from Johannesburg to Cape Town. Here at the bottom of Africa where the Atlantic and Indian Oceans meet, penguins frolic in the surf and bray with a donkey like sound as they waddle on the shore. The countryside is heavenly. Perfect weather next day found us riding the revolving cable car up Table Mountain for a view of land and sea. What an expansive vista can be enjoyed from the top of this rock. Next stop a winery where we sampled an assortment of cheeses paired with different wines. Not being a lover of spirits, I parked myself near two ladies on a bench outside to enjoy the sun and munch a few olives purchased at the attached market. Soon several of our group joined in the olive feast as did our bench buddies, both delightful South Africans from a nearby town who were out to enjoy a day in the country. Cape Town is home to Kristenbousch Gardens, a UNESCO World Heritage Site featuring native plants, running streams and so many birds. Luckily we started at the top and worked our way down through twisting paths to the bottom of the garden which is beautiful at every turn. Next day we flew to Kapama, a thirty four thousand acre private game preserve, which adjoins Kruger National Park. Here spacious, well appointed rooms and abundant buffets provided a touch of luxury. Arising early we were on our way to see the animals. Impala by the herds greeted us first but soon we were watching a giraffe drinking from a water hole. In a matter of minutes three scampering hyenas, arrived to play in the water. They chased each other and sniffed the ground giving no mind to the giraffe, who paid them no more attention than he paid to our truck parked close by. In the bush everything knows it’s place and those animals near the top of the food chain have no reason for fear. Everyone wanted to see elephants which proved elusive that morning. After several hours zipping along rutted dirt tracks in our four wheel drive Toyotas, four trucks filled with our party came together for coffee, hot chocolate and snacks served by the trackers. Each truck was driven by a ranger, a young man skilled in driving and possessing loads of information about the animals and trees. Though they are keen eyed spotters the real stars of the safari are the trackers. These men, some not so young, perch on the front left fender of the land rover sitting on a small seat equipped with two handles. No seat belts for them, just a good grip. Using hand signals to alert the ranger to low hanging branches and the presence of wildlife, they are truly eagle eyed. We saw some fish eagles and an assortment of ducks, herons and storks, speaking of eagles. About ten a. m. We returned to the lodge where an expansive breakfast awaited. At three we gathered for tea before starting out on our afternoon safari. This time we hit pay dirt, a leopard had taken down an impala. Our ranger said leopards usually hunt at night so it was a rare site in the afternoon. The leopard was eager to take the kill up a tree where he would be safe from lions and hyenas both capable of stealing the carcass. First, he had to get past at least a hundred impalas standing in a clump making loud grunting noises. These served as the impalas’ way of showing their displeasure but more important the noise might actually attract a lion or hyena who would run the leopard off and take the meat for his own. What we saw soon after was another amazing sight. A group of female lions had killed a wart hog. While the lioness who made the kill ate first the others waited their turn. The big cats who had already eaten lay in a stupor. So full were they it was too much for them to do anymore than open their eyes to see our vehicle before going back to sleep. We were very close but they were not concerned. Our ranger explained that as long as the nine of us stayed seated and quiet the lions had no idea we were actually juicy tidbits, they saw only the truck and were not interested at all. Later, we watched as a male lion ate his fill of some unfortunate creature while the females who had done the hunting waited none too patiently for him to finish so they might feed. Even the cubs could not resist joining their mothers in some growling to show their displeasure. As the sun went down in a blaze of orange and red, our group met up at a pre-appointed place for some nibbles and drinks. It is a thrill to behold the Southern Cross and the evening star, which is Jupiter, from the darkened plains. Our trackers broke out large flash lights whose beams they swept back and forth to see what game might be near. The tracker uses the light to find the animals but does not shine the beam at them as this will temporarily blind them. Sight is very important to keeping ahead of predators. Back at the lodge we enjoyed a barbecue of local favorites as well as chicken, fish and many side dishes. We ate with our safari group, the ranger joining us to tell stories of recent adventures. Leaving Kapama, we returned to Johannesburg for an overnight near the airport. Next morning we were off to Zimbabwe and the wonder that is Victoria Falls. The Zambezi river is wide and shallow and teaming with hippos, elephants and lots of birds which we enjoyed seeing on a sunset cruise. And what a sunset it was, fiery and crimson colors melted into streaks of pink and purple all in a few minutes. No expanse of water I had ever seen prepared me for the wonder of Victoria Falls, with water rushing hundreds of feet into a deep gorge, one of seven the river has dug. I was thrilled to finally ride a helicopter, this one taking us along the river and falls for some wonderful views of just how massive the water is. We were fortunate enough to be at the falls for the full moon. Victoria Falls and our own Cumberland Falls are the only two places on earth to see a moon bow. Though the night was overcast, see it we did. On the far bank of the Zambezi sits Livingstone, Zambia, a town named for that great explorer who came to Africa as a missionary. We were fortunate to hear a local historian tell of the extraordinary life of Dr. Livingstone who suffered from malaria many times and whose wife and several children died in Africa. Though Livingstone came to Africa to bring Christianity his greatest contribution was to report back to England on the slave trade. So appalling were his accounts, England banned slavery soon after Livingstone made known what was happening. Of course, Dr. Livingstone’s meeting with American newspaper reporter, Henry Stanley, resulted in the famous greeting, “Dr. Livingstone, I presume”. A large statue of Livingstone stands on the bank of the river very near the falls he named for his queen. We enjoyed seeing hippos, the river horse, who spend most of their time in water eating grasses and staying submerged except for nose, eyes and ears. They don’t swim rather walk on the river bottom. Though innocent looking many deaths each year are caused when surfacing hippos overturn small fishing boats. Elephants too enjoy the water, spraying each other with their trunks and sometimes walking to low lying grassy islands near the middle of the river. Botswana was our last stop. The Chobe National Park and Chobe river are a wonder of wildlife. Crocodiles bask open mouthed on the river bank while zebra, impala and buffalo cautiously drink nearby. The Chobe is shallow and so wide. Waving grasses and seas of water lilies shelter hippos. Birds are everywhere. The river is the dividing line between Botswana and Namibia, both countries have safari lodges and river boats taking ever more tourists to see the animals. All too soon, we were boarding an airplane in Kasana, Botswana for a flight to Johannesburg, the first leg toward going home. We arrived back in the US at Dulles, then a connecting flight to Atlanta before our last stop in Louisville. Though getting there is long, the time spent seeing the beauty of the land and the wonderful animals makes it a most worthwhile trip. I still can not believe I sat only a few feet from a grazing rhino, saw baboons swinging in the trees and watched as a cheetah lazily walked up the road in front of us, paying only a few backward glances before bounding into the bush. Go, see South Africa, you won’t believe your eyes! Error: Error validating access token: Session has expired on Monday, 28-Jan-19 01:47:45 PST. The current time is Tuesday, 23-Apr-19 23:17:00 PDT.